Efficient image processing is central to our business. Designed and developed entirely in-house our photo processing system allows your forms, in either digital or paper format, to be processed for information gathering. 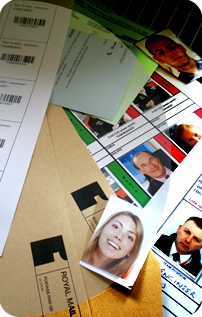 ID photographs can be cropped out of the document, scaled and sized in any way and saved to a database with any associated data. We can assemble membership packs, matching id cards to other documents inserting to addressed envelopes and mailed directly to your member.